Have a soft spot for the Boys in Blue? 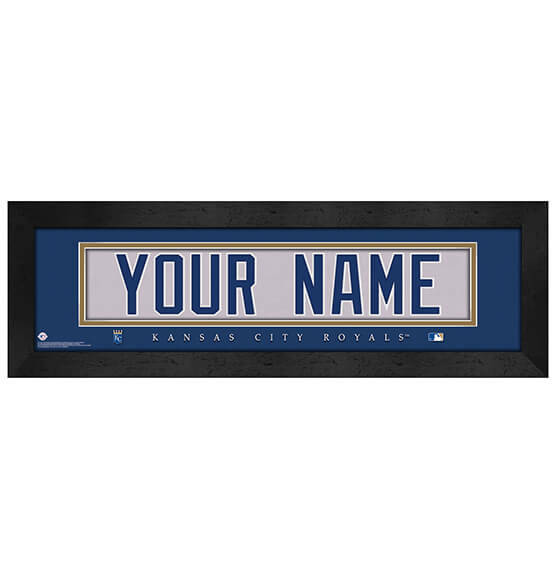 Ideal for the number-one fan, this custom Kansas City Royals Framed Nameplate Wall Art shows the world where your allegiance lies. This memorable sports decor is customizable up to 12 letters for a one-of-a-kind gift that is sure to be treasured. Quality MDF vinyl-wrapped frame and vibrant team colors make this piece look great no matter where it hangs. It is made to look like the back of a Kansas City Royals jersey, so you'll instantly feel like part of the team. Our personalized nameplate makes a great for a gift for any special occasion! This wall art arrives ready to hang thanks to a convenient sawtooth hanger.